TORONTO, June 20, 2016 /CNW/ - The Sheraton Centre in Toronto was abuzz tonight as the Canadian music industry gathered to pay tribute to Canada's best songwriters, composers, film and TV music scorers, lyricists and music publishers at the 2016 SOCAN Awards. Emceed this year by bestselling author Dave Bidini of the Rheostatics, and sponsored by Gowling WLG, KPMG, HMV, Long & McQuade, Music Canada, Ontario Media Development Corporation and RBC, the SOCAN Awards honour the accomplishments of the people who create Canadian music, recognizing them in a diverse cross-section of categories: Pop/Rock, Film & Television, Urban, Dance, Folk/Roots, Jazz, Country, Classical, and more. 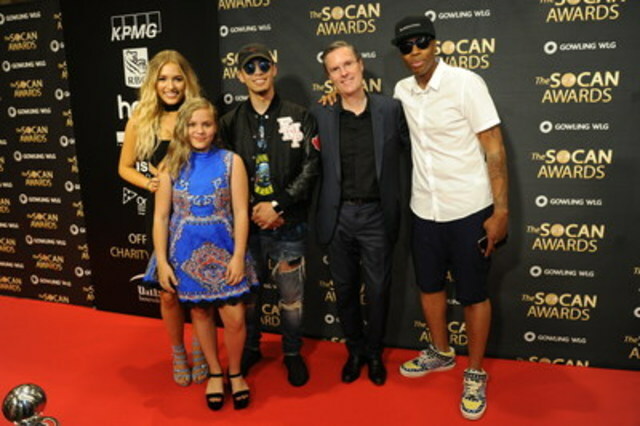 SOCAN's presented major achievement awards this year to Hockey Night in Canada theme composer Dolores Claman (Cultural Impact Award); Canadian music industry driving force Gary Slaight (Special Achievement Award); global phenomenon The Weeknd (International Achievement Award) and his frequent co-writer Ahmad "Belly" Balshe (Songwriters of the Year); chart-topping teen Alessia Cara (Breakout Award); and multi-platinum singer-songwriter Johnny Reid (National Achievement Award). The evening included memorable live performances from hit songwriter Shawn Hook, who sang his smash single "Sound of Your Heart"; celebrated singer-songwriter Matt Barber, who played a poignant version of Edward Bear's "Last Song"; young sensations Lennon and Maisy Stella of the hit TV show Nashville; Crash Test Dummies frontman and creative force Brad Roberts, who performed "Mmm Mmm Mmm Mmm" and "Afternoons and Coffee Spoons," two of his SOCAN Classics Award-winning songs of the evening; young, multi-instrumentalist and singer-songwriter Jordan Hart; and Reid, who sang a passionate version of his song, "What Love is All About." Throughout the evening, attendees were greatly entertained by a live orchestra that highlighted the outstanding work of our film and television composers. Attending to receive their awards were Trevor Guthrie, who won the Dance Music Award for his song, "Summertime"; Jason Blaine and Deric Ruttan, who co-wrote Blaine's hit song "Country Side," which earned a SOCAN Country Music Award; Pop/Rock Music Award winners Francesco Yates, Jocelyn Alice, and Scott Helman, who won for "Better to be Loved," "Jackpot," and "Bungalow," respectively; Oscar-winning film composer Mychael Danna and San Andreas soundtrack composer Andrew Lockington, who both won for Achievements in Feature Film Music; Keith Power, who earned an International TV Series Music award for Hawaii Five-O; Ebony "WondaGurl" Oshunrinde and Bryan "Eestbound" Van Mierlo, who co-wrote the huge Travi$ Scott hit "Antidote," which won an Urban Music Award, as did Drake's "Hotline Bling," co-written by Paul "Nineteen85" Jefferies; and Simon Wilcox, who won two Pop/Rock Awards, for co-writing both the Nick Jonas global hit "Jealous" and the aforementioned Scott Helman Canadian hit, "Bungalow." "The people who write, compose and publish Canadian music are providing an essential service for our national culture, pride and economy," said SOCAN CEO Eric Baptiste. "Canadian songwriters and composers are making fantastic music that has made a massive impact, both domestically and throughout the world. Similarly, our music publisher members play a crucial role in expanding the market reach of that great Canadian music. We're pleased and proud to congratulate all of tonight's SOCAN Award recipients for their tremendous accomplishments." SOCAN will also recognize outstanding Francophone music creators and publishers at an awards gala in September 2016 at Métropolis, in the heart of Montréal. "Raised by a Good Time"
"This Beat Goes On/Switchin' To Glide"